This month’s Diet, Dessert and Dogs SOS Kitchen Challenge ingredient is beets. My entry is really a two-fer; my adapted recipe plus the original one that inspired it. I never make the inspiration recipe anymore but I just wanted to share it as a hot vegetable option. The Tarragon Pickled Beets recipe is so simple it hardly qualifies as a recipe. 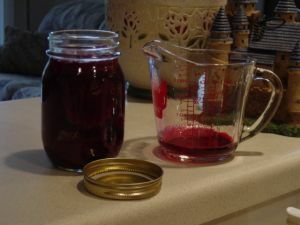 It was adapted from a Harvard-style beet recipe to make one of my ‘Mason jar specials’ that were brown-bag lunch staples while I was working in the corporate world. There were 4-5 different ones that I made up for lunch treats. 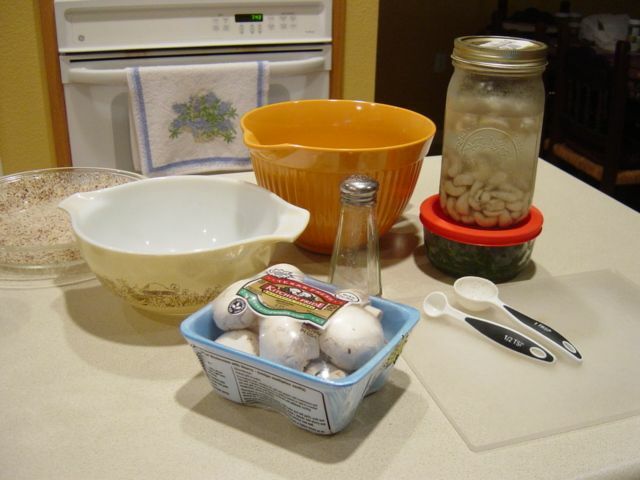 You don’t have to have a genuine Mason-type jar but you do need a jar with a tightly sealing lid. Fresh cooked beets, tender and sweet, are ideal if you have them. A 16-ounce can of sliced, diced or cut beets from your pantry will get you there also. Put an ounce or two of beet juice in the jar. Stir in the sweetener, vinegar, and tarragon and then carefully spoon in the beets (so that red juice doesn’t splash and stain). Add enough reserved beet juice to cover your beets. Screw on the lid to make sure it is sealed and won’t leak. Shake to distribute the juice and seasonings evenly. Keep them in the fridge until you are ready to use them. Mix the sugar, salt, paprika, cornstarch, lemon juice and beet juice in a small saucepan. Stir over low heat until the mixture bubbles and thickens. Add the beets and continue until beets are heated through. Even though officially retired I still make the Tarragon Pickled Beets to jazz up lunch or garnish a salad every now and again. Who remembers anymore what carrots look like fresh out of the garden? It came as somewhat of a startle when a large sack of carrots- roots, frost bit tops, mud, gnats and all showed up in the food pantry last Friday afternoon. The carrots themselves were fat and beautiful but I knew we would have to work fast to get them distributed. We divided out two pound bags and started giving them out with food orders. There was not the usual flood of clients that day (a rare occurrence) so we gave them out to all comers who stopped by the window. At the end of the shift Ann and Megan had already left and I didn’t have time to write up a note and put that one last lonely bag in the fridge. So I brought it home to reacquaint myself with basic veggie preparation. 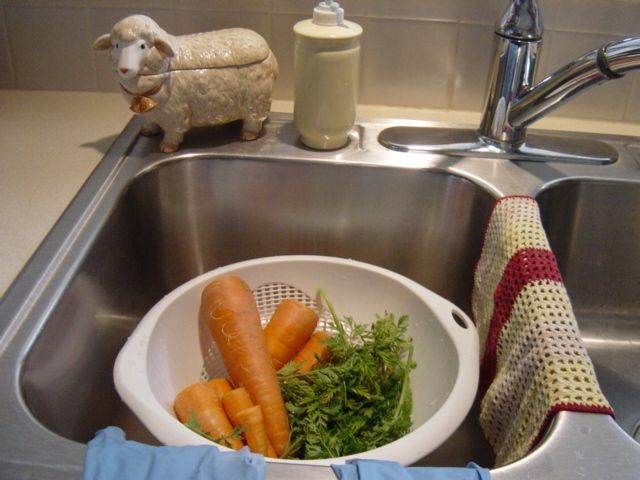 Into the sink with all of them, spray hard to soften and rinse off most of the mud, and untangle the tops (they were a large, green&brown, unruly fright wig mass) – they filled up the sink. Then I cut off the roots and carefully picked out the good green tops and threw away the brown ones. The roots were scrubbed with a brush to remove the last bits of mud from the crevasses, the greens were rinsed again and all of it set aside to drain. 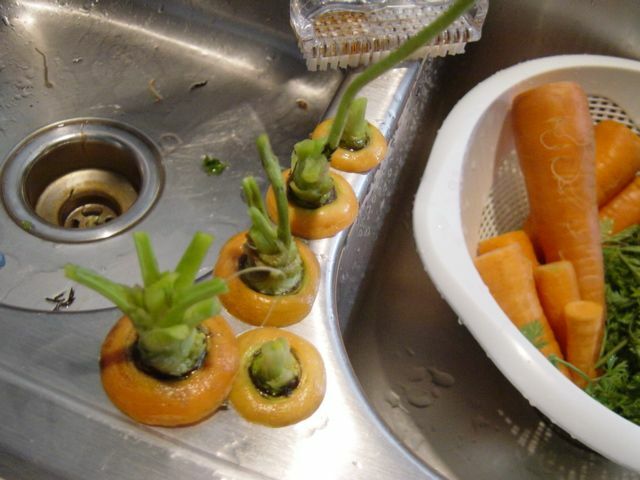 The top part of the carrot where the greens join the root was too hard to clean so that bit was trashed as well. Why bother with saving the greens? As I learned after my previous post on Carrots the green tops are not only edible but they are fabulously nutritious and all of that is usually thrown away by the time carrots arrive in the produce section of your grocery store as I was notified by the World Carrot Museum. I hadn’t cooked quinoa in quite a while – too busy with baking experiments and other activities. 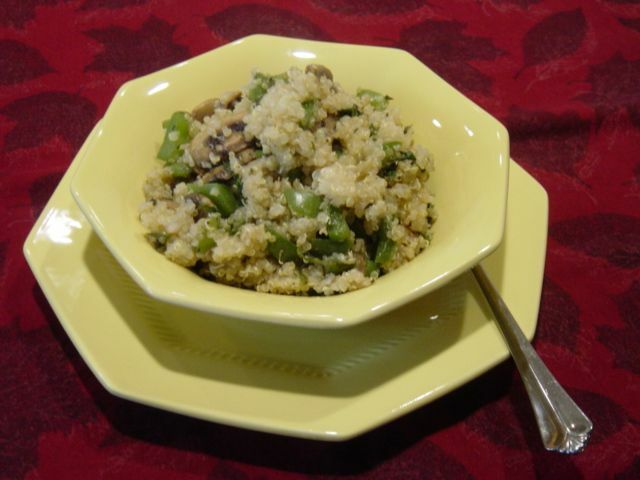 But when I came across this recipe at Karina’s Gluten-Free Goddess blog for Quinoa Mushroom Pilaf something clicked into place. Mushrooms and green peppers in the fridge?, check, garlic?, check, parsley?, no but I have used carrot tops as a substitute before – so I really, really had to make this dish! Ricki’s blog, Diet, Dessert, and Dogs is one of my favorite reads. Today she had a very interesting discussion going, All About Stevia. This product is something I have been playing with since Rita bought me a bottle of Sprout’s brand of liquid stevia over the holidays. So far I really like it as a sweetener in my lattes, both café latte and chai latte. The recent recipe for Banana Coconut Muffins has been well received by my taste test crew – with no added sugar, the sweetness all comes from a banana and that liquid stevia. And finally I have really gotten into Ricki’s super healthy creation Chia “Tapioca” Pudding. I’ve been having it most mornings for a couple of weeks. Chia has a fascinating nutritional profile and is now starring as one of the newest ‘super foods’. Soaked chia seeds are gelatinous in texture and a spoonful of chia seed mixed into liquid will set up as a soft pudding. I use 1/2 cup of warm almond milk adding one tablespoon of chia, eight drops of stevia, and four drops of vanilla. When set aside for several hours it becomes very much like a tapioca pudding because of the swollen seeds. They are seeds and may not be suitable for consumption by anyone that has texture issues! Chia is available pre-ground and if you plan to use ground chia I say buy it that way – I keep both on hand. My attempt to grind them with a mortar and pestle would make a good you-tube comedy – not one of the seeds were ground; instead they popped out all over the counter like a flea circus. The whole dry seeds are extremely hard and also have a static charge – not easy to chase and gather them back up. Ground chia is one of several substitution possibilities for replacing egg in baked goods for vegans or for those folks with egg allergy. Sprouted chia seeds can be used in salads and for sandwiches as well as on your Chia Pet. Four weeks ago I bought bananas to ripen for banana muffins and possibly banana bread. Two batches of those Coconut Banana Muffins later and there were still four v-e-r-y ripe bananas hanging out in the guest room. So this afternoon I conjured up a new recipe that I had been thinking about, put it together, and I’ll post about it tomorrow. It’s been quite a long day in the kitchen. When Don used to travel for work and I was at home at the house in the woods with only the cats for company, cooking everyday for myself was not a priority. There were too many other projects going on around the place. This was my home-crafted bookcase period (eventually seven of them), learning to crochet afghans and throw rugs, and attempting to landscape in caliche soil with alkaline well water compounded by the persistent Central Texas wildlife and blistering heat. Cooking this hearty casserole that lasted several days freed up more time for those other endeavors. This was (and still is) one of my favorite combinations. It is easy to adjust the seasonings to your own preferences or seasonal vegetables. 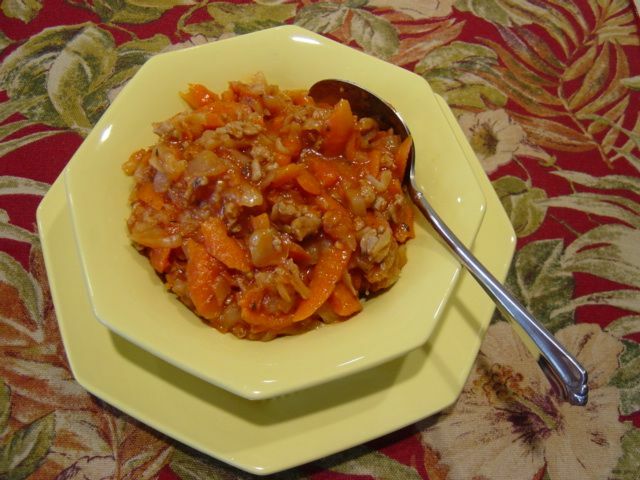 This can be cooked in a crockpot, in the oven, or on the stovetop and for me that usually depends on the weather. If it is winter the oven or stovetop adds more warmth to the house. In summer the crockpot helps to avoid that. This week’s batch omitted the rice (the post-holiday low-carb version) and with no rice to be cooked the casserole only needs reheating to serve. Place all ingredients in a very large skillet or pot and sauté until the cabbage is bright green and onions are transparent. Cook all ingredients until all traces of pink are gone and set aside. Grocery stores now carry pre-seasoned ground meat and sometimes I just cook up a package of the lean ground turkey with Italian seasoning (ever lazier – that’s me). Puree the tomatoes in a blender. Add the other ingredients and blend. Layer these ingredients into a casserole starting with 1/3 of the cabbage, followed by 1/2 of the meat, 1/2 of the rice, cabbage, meat, rice, and finishing with the cabbage. Pour the sauce over all and work it into the casserole layers with a spoon. Bake it at 350*F for 45 – 60 minutes – checking to be sure the rice is done. This batch provided enough for two hearty dinners for both Don and me – we don’t call it leftovers we call it planning ahead! In the post-holiday, workout, trim-back-down season it gets crowded up at the fitness center. We’ve been going a little later in the evening when it is easier to make use of the equipment without a lengthy wait. Part of the strategy also is to cut back on calories and for me that means load up on the salads and fresh veggies – not much baking going on right now. Theoretically I know that it doesn’t take that much effort to whip up a homemade salad dressing and wow, they are so much tastier than bottled dressing from the grocery store. But I don’t have the dedication to do that every time so there is always the gluten-free dressing in the fridge or pantry for a fall-back option to keep the diet on track. 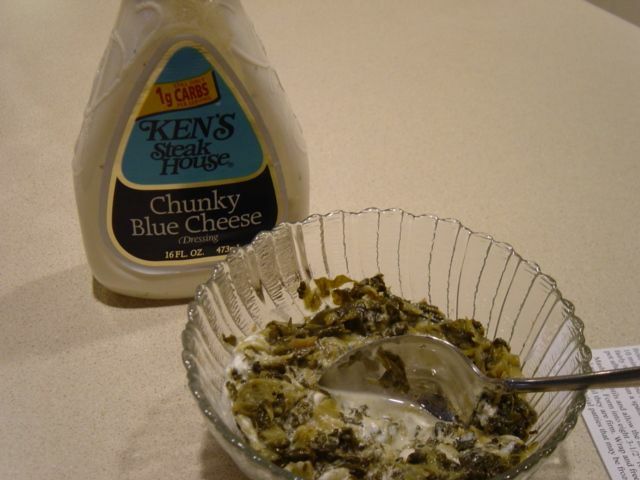 Ken’s Salad Dressings has many options ranging from fat-free, light, regular, gourmet and a few other choices. I am a big fan of Balsamic Vinaigrette and Chunky Blue Cheese – not your low-cal versions by any means but if it tastes really good it helps me to stay on track. Put the ingredients in a microwave safe dish and microwave for 30-40 seconds. Dig in. It is healthy, low in carbs and calories, high in vitamins and a bunch of other stuff that is really good for you. Do something good for yourself and it gives you a lift! This is another one of those versatile recipes that can be a side dish or a full meal with vegetarian options as needed. 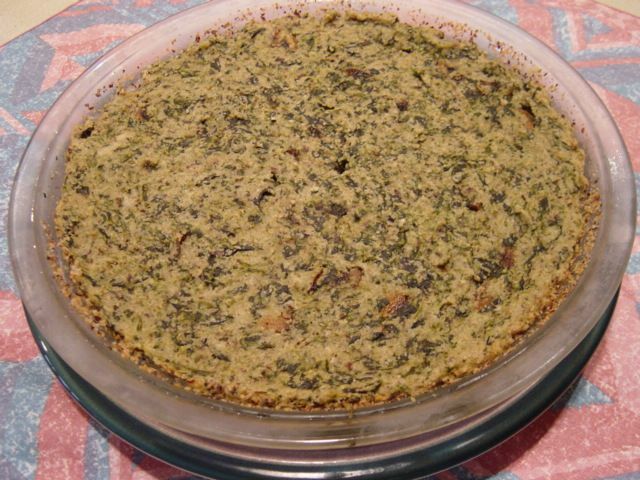 The truth is this recipe was inspired by the Greek Spanakopita spinach, onion, cheese, and herb pie. The mushroom layer is optional and not even part of the dish that inspired this – I just like mushrooms a lot and the ones in the produce section were locally grown and looked especially good. This is a great low-carb meal for the New Year’s get-back-in-shape resolutions as well as a super healthy year around choice. The spinach layer is where the essential combination of seasonings comes together. Fresh parsley really sparks this and it is worth waiting to get your hands on some before you put this together. I scattered a packet of seeds in the flower bed 4-5 years ago. In spite of my black thumb, deer, rabbits, Texas sun, and most recently freezing rain there was still fresh green parsley out there on January 1for this recipe. The dill came dried in a jar; you can use garlic powder, but please find fresh parsley somewhere. The lemon zest is part of the classic seasoning but afterwards I decided not to use it anymore. Classic Spanakopita is enclosed in rich flaky phyllo pastry dough. This casserole ignores all grains and either stands alone or layers with meat, tofu, or beans. We had some extra lean ground turkey with Italian seasonings in the freezer that I sautéed for the bottom layer to make a hearty meal for Rita and David before they departed for Virginia. The leftovers made my lunches for a couple of days . . . . Prepare your optional protein layer and set aside. 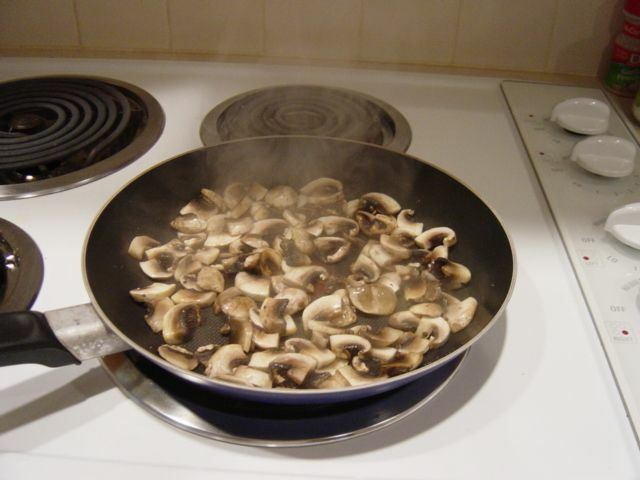 If using mushrooms then sprinkle lightly with sea salt, sauté them in a skillet with a bit of olive oil until they are fragrant and slightly brown and then set them aside. Add the tablespoon of olive oil to the skillet and sauté the onion and garlic. When they are translucent then add the spinach, cover, and steam until the spinach is bright green and tender, maybe 6-8 minutes. Add the parsley, dill, and lemon seasonings and mix well. Lightly oil a square, oven-proof baking dish. Cover the bottom with cooked ground meat, sautéed seasoned tofu, or your favorite cooked beans (well drained) if you use this layer. Then layer the sautéed mushrooms in if you are using them. Then carefully spoon the spinach mixture in next. Beat the eggs and dairy products together and spoon over the spinach, spreading to cover. Place the casserole in a 350*F oven and bake for about 35-40 minutes. The mixture will be firm enough to cut into squares for serving. Let it cool for 5 minutes or so before serving. The recipe makes about 6 – 8 servings depending on your layers and how hungry you are. This is the rice dish most requested by my family. It is easy to put together and the rice cooks while the rest of dinner comes together. The seasonings have changed as the children grew up and still it remains a favorite (basil, marjoram, and savory have replaced plain parsley). Rita is in Texas for the holidays and we had this with roasted chicken and green beans last night. Heat the oil in a skillet over moderate heat. Add onion and cook until it is wilted. Then add the rice and cook until each grain of rice is golden yellow in color. Some grains will begin to brown and some of the rice starch will be sticking to the bottom of the pan. Drain excess oil if necessary. Add the broth, basil, marjoram and savory. I usually use 2 cups of water with 1 tablespoon of gluten-free broth concentrate and that takes care of the seasoning. You may need to add salt and pepper to taste. Simmer covered for 20-25 minutes until the liquid is absorbed. Turn off the heat. Add the cheese, stir well, and allow it to mellow until the cheese is melted. There was rice leftover with just three of us for dinner and I plan to mix it with some leftover butternut squash for lunch. A Holiday special of note: Ricki at Diet, Dessert, and Dogs is giving away a cookbook, your choice. So get over there and register for Festive Freebies 2: Reader’s Choice Cookbook Giveaway .